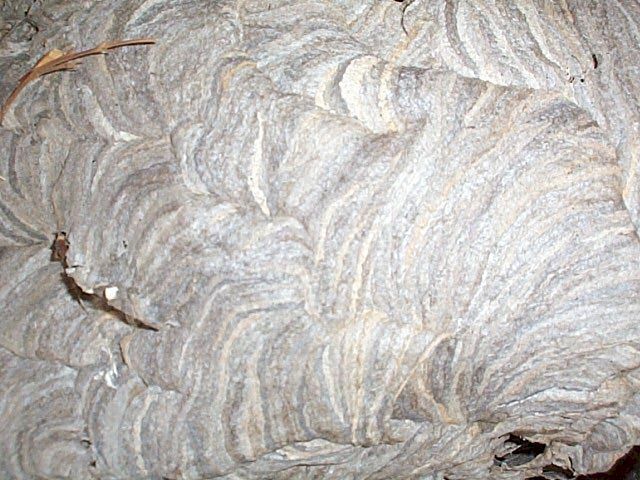 I have been around many bald face hornets nest here in mendocino co. california. In fact I have one right now on the back side of my solar panel tracker. 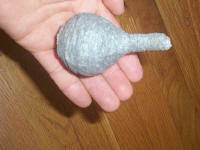 Its attached to back of one of the solar panels and wrapped around wiring harness. Very nice as I've watched it grow all summer from my deck. Its as large as a basket ball. Hornet story: I found a large rattlesnake caught in the chicken wire fence around my veggie garden. It had died so it was a snake in perfect condition and I decided I wanted to try and strip it of its flesh and have this great rattlesnake skeleton. 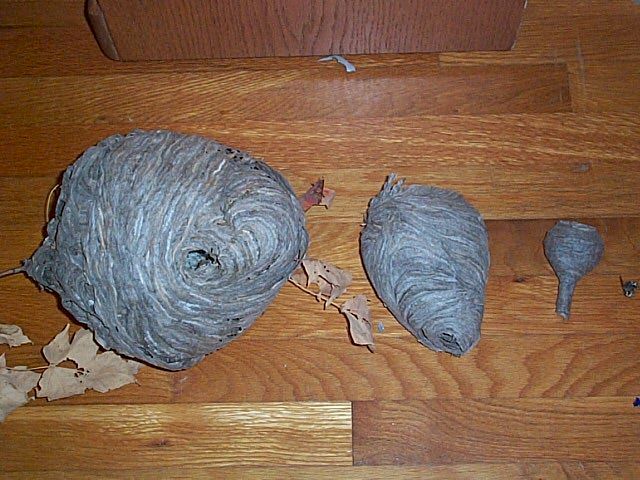 Local yellow jackets I thought would be the ones to strip away the flesh. Tacked out on piece of plywood the yellow jackets had more than half of the flesh eaten whithin a week. 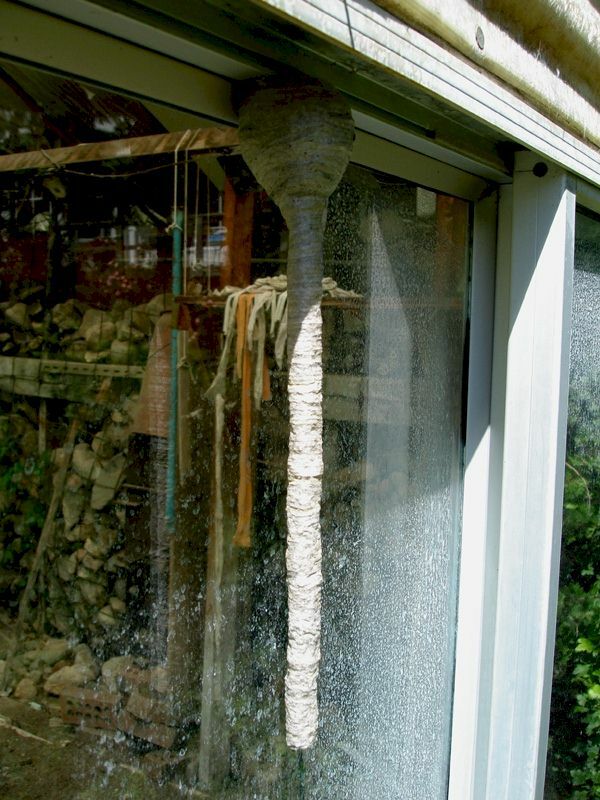 I have watched bald faced hornets chase and catch yellow jackets in my garden over the summers and that same scene played out with this dead rattlesnake. 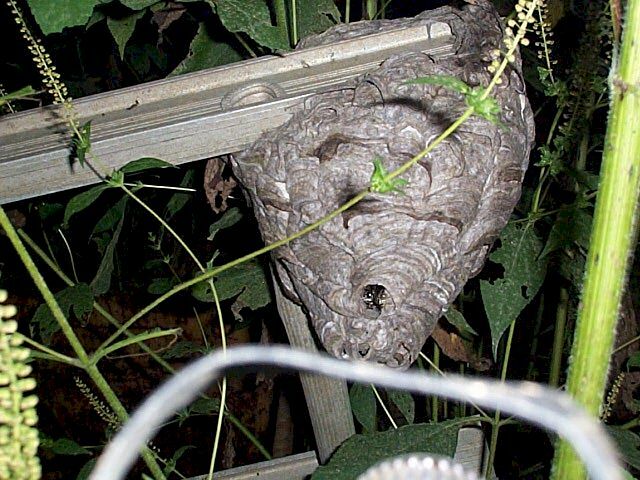 What was amazing though was the bald faced hornets started hiding inside the exposed ribcage of the snake and when the yellow jackets would squeeze thru ribs to tear off meat inside the hornets would grab them, kill them and squeeze back out thru ribs with prize in they're jaws. Pretty cool show to watch up close. Keep the neat hornet stories coming.. 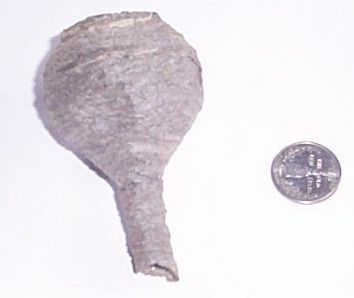 This huge bald faced hornet nest - found near a park - from 1999 was at least over a foot in diameter but it is very elongated and has a very small entry hole. 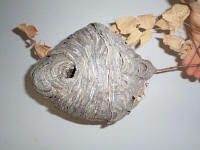 The bald faced hornet often builds a large gray paper nest suspeneded from tree branches or the eves of the house and depending on the area one will see a species of yellow jacket called aerial yellow jackets that make a similar nest like the bald faced hornet. 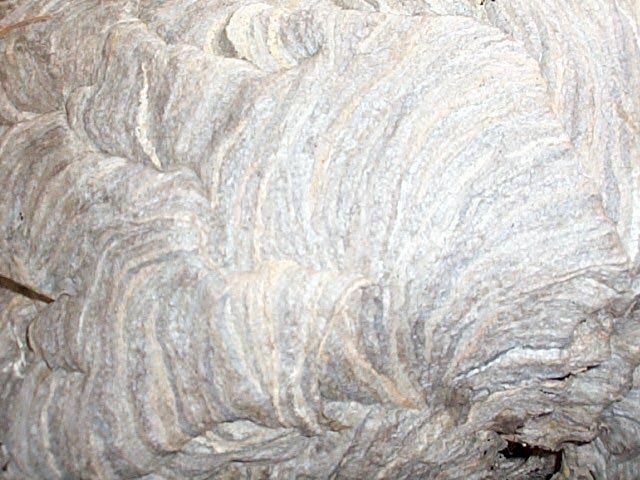 In 1999 I found a HUGE bald faced hornet nest near a park that had a few in it one of which buzzed up my shirt. 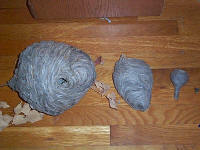 Heres a photo of some of my hornet nests the one in the middle is from the aerial yellow jacket. 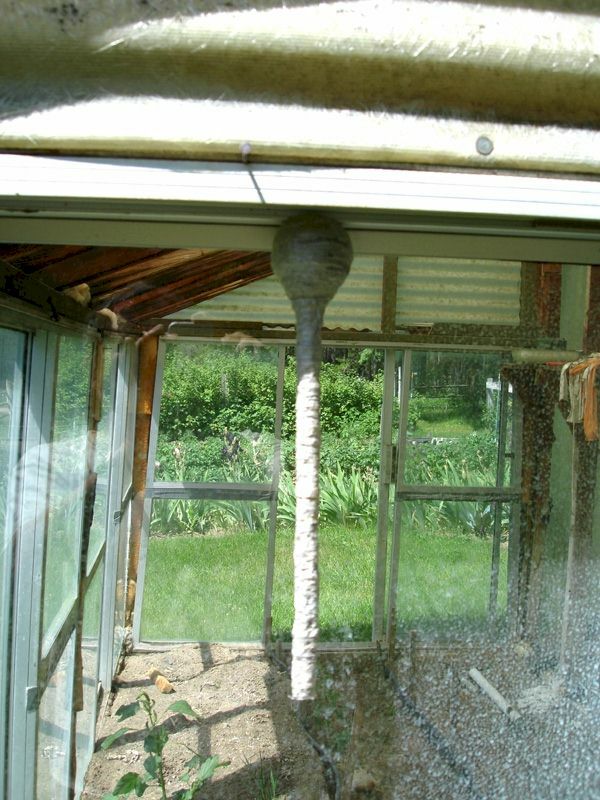 Something really strange I have seen bald-faced hornets queens do when making a nest they will often have an entrance tube that can be anywhere from 3 to 6 inches long. But sometimes the entrance tube is much longer! The tube portion of the next pictures was a good 38.5cm's long and 1.4 to1.5 cm in diameter! Heres photos of live bald-faced hornet nest on ladder. 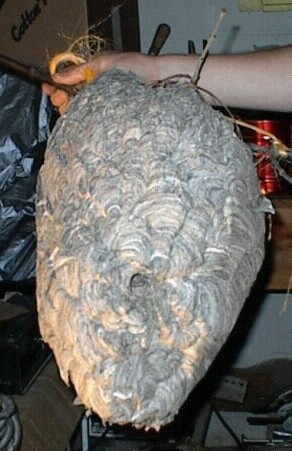 This is the first time I have shot photos of a live nest. The wet looking spots are area where new pulp was being added. 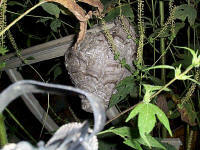 They were taken in the dark because during the day I was afraid to get too close so I did it at night which let me get closer. 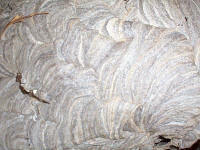 next page: Bald-Faced Hornets, Part 3!